Pixe LLC, the Maryland-based social marketing solution provider, announces the release of the EXHIBITOR2014 Pixe Social Photo Booth ROI Analysis Infographic. Pixe Social, the leading mobile photo booth-based social marketing solution, powered the official photo booth for the 2014 EXHIBITOR2014 Welcome Reception and in the Exhibit Hall, extending the brand’s reach to over 28,000 fans on Facebook. 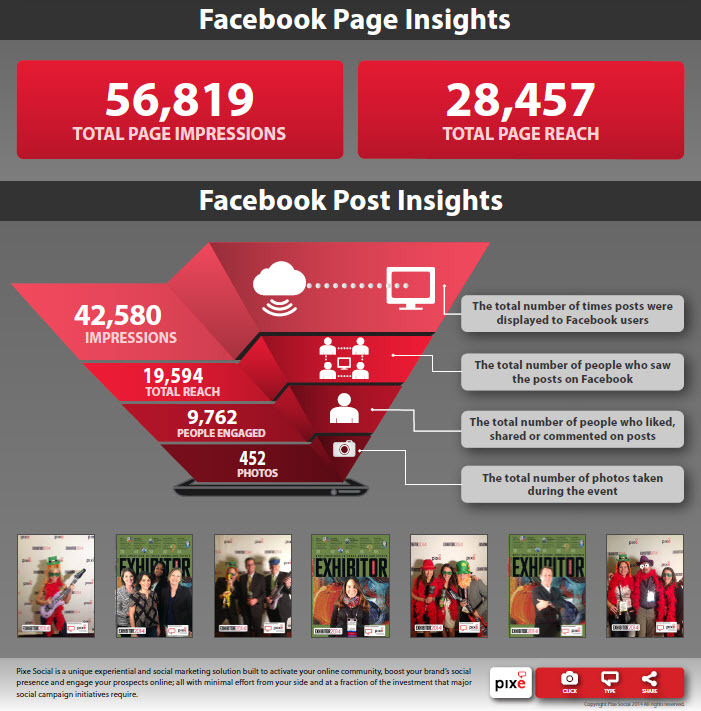 The 452 photos shared from the EXHIBITOR2014 Pixe Social Photo Booth were viewed by 19,594 people 42,580 times on Facebook between the period March 17 – 30, 2014. In addition, 9,762 unique people liked, shared, and commented on the photos, extending EXHIBITOR’s reach exponentially. “Pixe Social’s revolutionary solution leverages user-generated content while also keeping customers engaged with the brand through subsequent marketing promotions, delivering significantly enhanced online engagement and more leads within a very short period of time," said Rajiv Jain, CEO of Pixe LLC. While exhibiting in the New Product Showcase at EXHIBITOR2014, Pixe Social was selected for the prestigious Buyers Choice Award. A panel of judges, including Certified Trade Show Marketer graduates, chose Pixe Social based on a number of criteria comprising design, applications, and industry needs. Enthusiastic users were given the opportunity to leverage Pixe’s green screen solution to see their own photo on the EXHIBITOR Magazine cover. The photos generated considerable engagement among onsite and online attendees during and after the conference, as is evident from the infographic posted below.